For toy car collectors who prefer their miniature rides a bit larger than just a few inches long, the Hot Wheels Elite line has been churning out some incredibly detailed models. 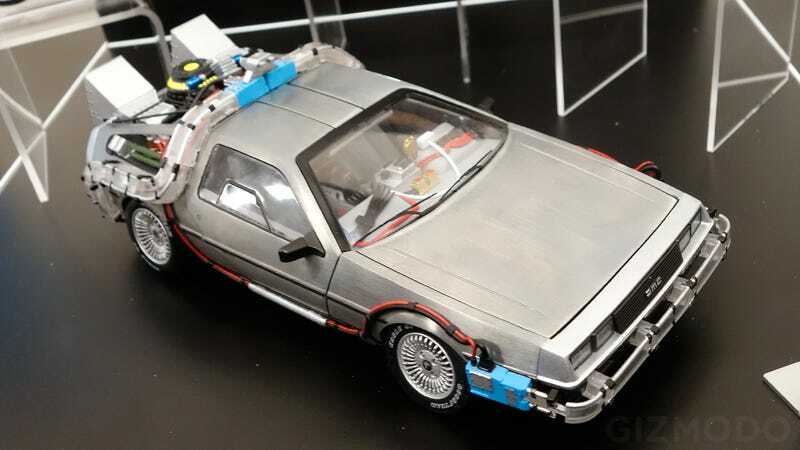 And at Toy Fair this weekend Mattel gave everyone a sneak peek at its upcoming take on the time-travelling DeLorean from the Back to the Future films. And yes, it's completely and utterly perfect. The BTTF DeLorean will arrive sometime in the middle of 2015 with a price tag already well north of $300 on sites that are selling pre-orders. And while that's certainly expensive, if any die-cast version of the DeLorean was worth that much scratch, this is it. The wheels fold-up for flight just like in BTTF II, there are countless sound effects taken from the films when you open the doors or activate other accessories like the flux capacitor, and everything that lit up in the movie, lights up here.